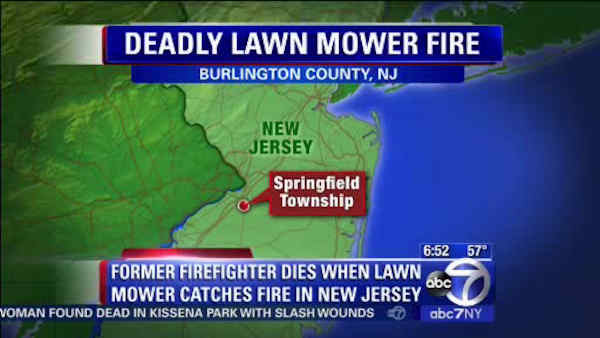 JOBSTOWN (WABC) -- Police in New Jersey are investigating the death of a former firefighter who was killed when his lawn mower went up in flames. The incident happened around 2:30 p.m. Sunday in Burlington County. Roger Lippincot, 79, was riding on the lawn mower outside his Jobstown home when it caught fire. Investigators say Lippincot, a retired Springfield Township firefighter, tried to put the fire out himself. He suffered severe burns when the lawn mower combusted, and he was pronounced dead at the scene. State Police Sgt. 1st Class Gregory Williams says the major crimes, arson and bomb units are continuing to investigate the incident. Springfield Township Fire Company Chief Brian Kokotajlo says Lippincott served as the township's emergency manager coordinator and taught at Burlington County's fire academy. Kokotajlo says Lippincott was the second retired Springfield Township firefighter to die in a fire-related accident within the last two years.